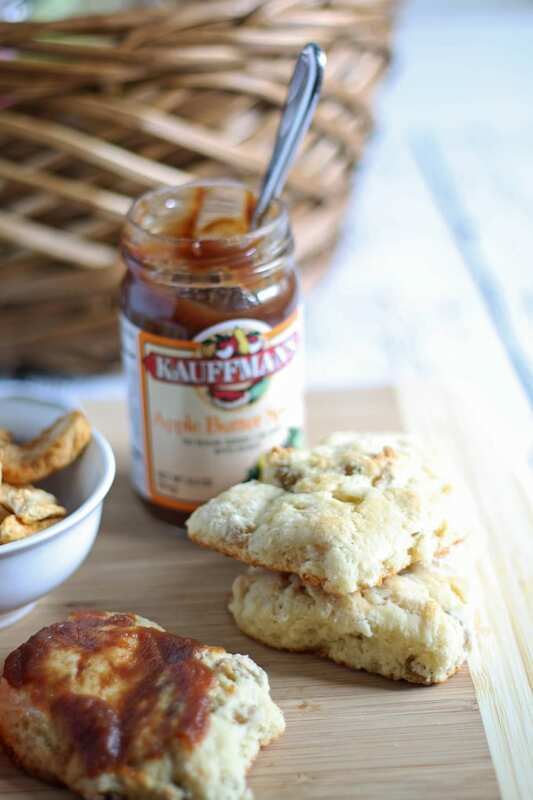 Golden raisin scones are perfect for picnic lunches, especially when smeared with apple butter. 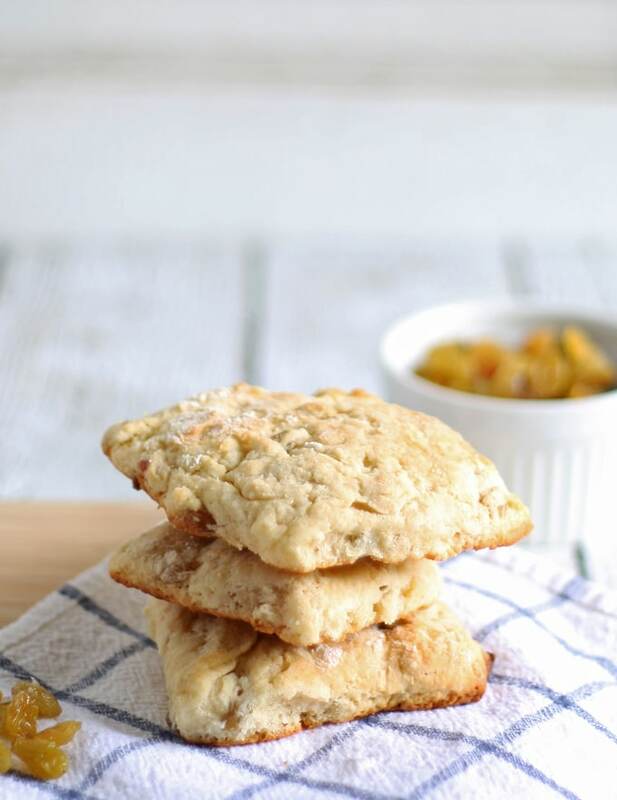 Try these delicious scones today! I partnered with Kauffman’s Fruit Farm. I have received these Kauffman’s Fruit Farm products for free; however, all opinions remain my own. I love fall. I know, I know – it’s only August and autumn doesn’t start for over a month. Forget summer though -I’m prepared for autumn. I have already pulled out my “I Leaf Autumn” t-shirt and am wearing it at least once a week. I’m thinking about all things apple and pumpkin. There may have been a dream or two that centered around a certain flavor of latte. I have been trying to convince Mr. B we should go on an picnic lunch once the leaves start changing. I have a plan I think will work. I am going to mention the relaxation factor of a picnic and the food. Oh yes, the food. I plan to set it up like a fall wine and cheese party with the wine replaced by some hot apple cider. To cover the wine/cheese party part I will pack some hard cheese and crackers, some soft cheese and crusty bread and a few sausage sticks. 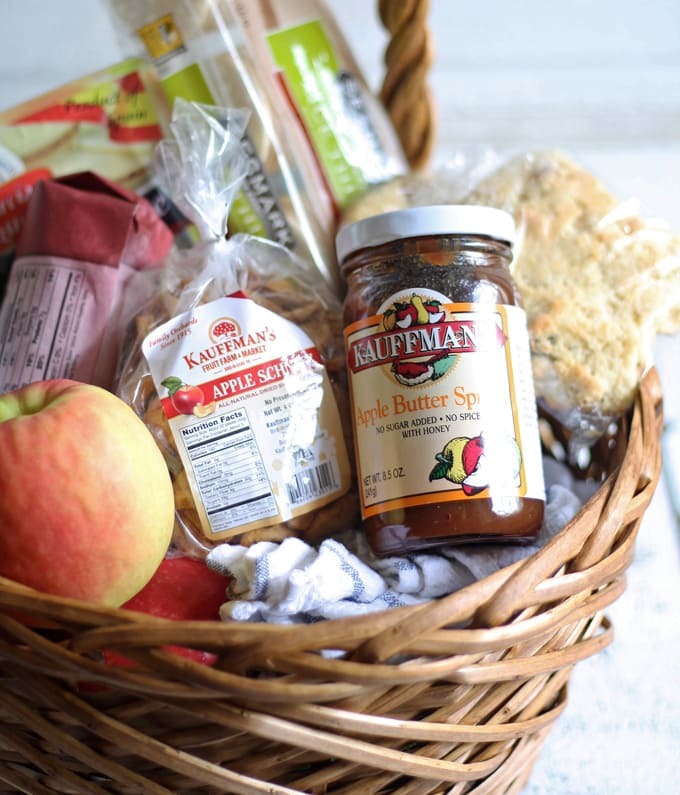 To cover the fall part, I’ll pack my Orchard Sampler Gift Box from Kaufman’s Fruit Farm, filled with juicy red apples, sweet dried apple schnitz , and homemade apple butter with honey. I’ll even make my delicious golden raisin scones! 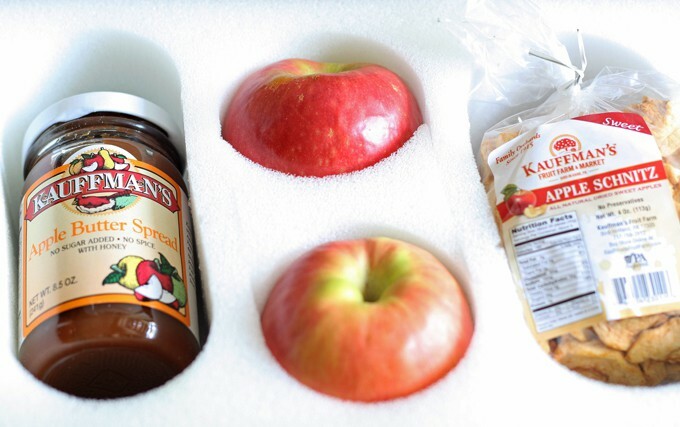 While very familiar with red apples and apple butter, we had our first experience with apple schnitzel when my sampler box arrived. We loved its chewy texture and that its all natural! 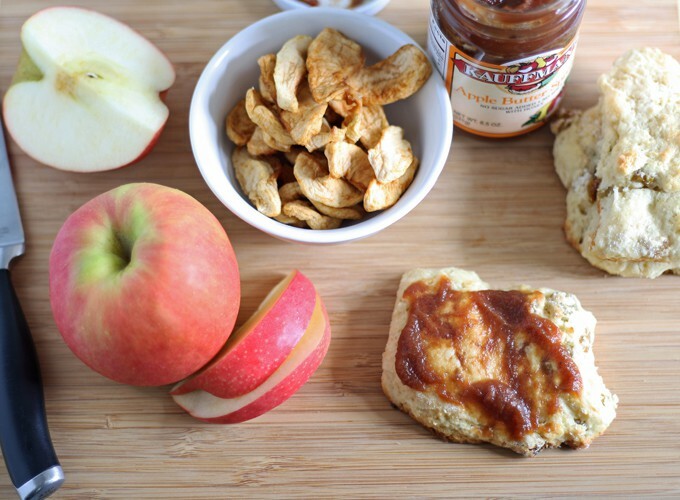 I could have made something with the apple butter that was perfectly “fall-like” but instead I decided to let it be in all of its delicious apple butter glory and smear it over some golden raisin scones. I love making scones and for me, it is one of the easier items to bake. 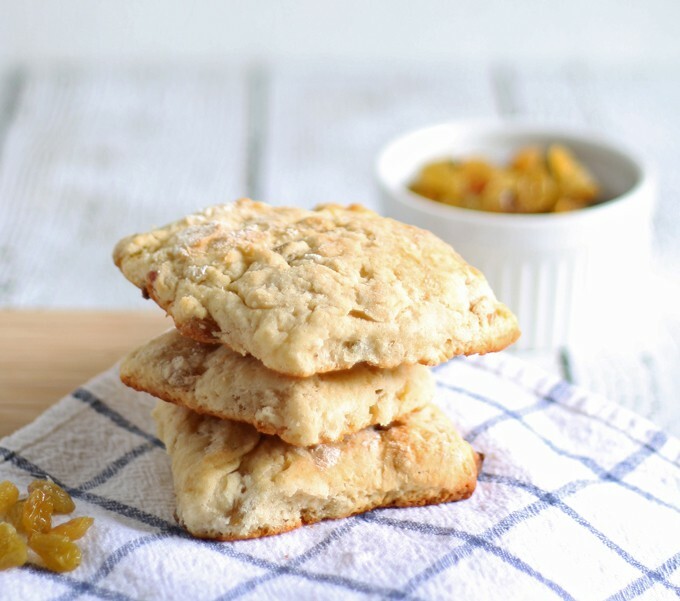 These scones get their sweet flavor from golden raisins. If you can’t find golden raisins, feel free to substitute regular raisins. Also, be careful not to overmix your dough – the ingredients should be just wet and cold when they go in the oven. In a large bowl, combine the flour, sugar, baking powder and salt with a whisk. Using a pastry blender (or two knives) add the butter to the dry ingredients. Cut it into the flour until it is pea-sized. Add the golden raisins with a wooden spoon. Then stir in the remaining ingredients with the wooden spoon until the mixture is wet. Flour your surface, then pour the dough on top of the flour. Flour your hands and pat the dough into a square about 1 inch high. If the dough sticks to your hands or the surface, add more flour. Cut the dough into 16 squares. Place on the prepared baking sheet and put in the oven. Looking for more baked goods, perfect for fall? 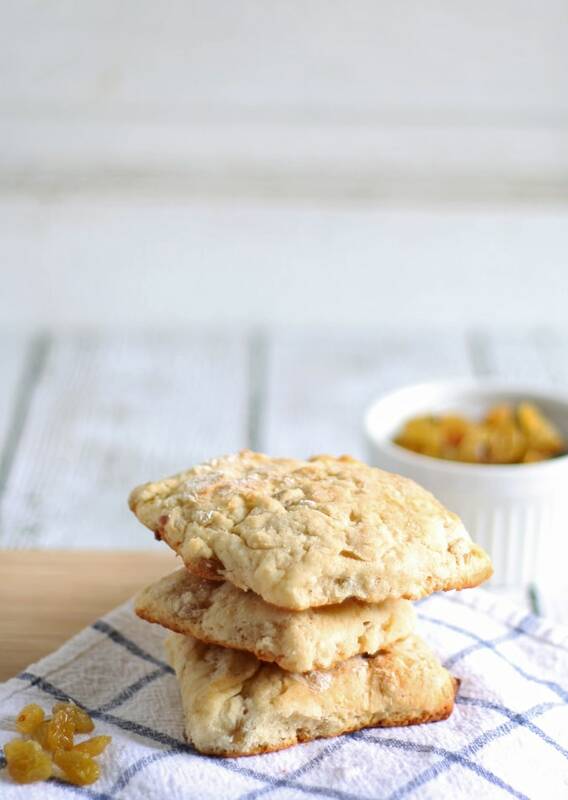 Try my pumpkin spice scones or my spiced apple muffins! Both would be great with apple butter! Thank you Laura – maybe I will make a batch for my very Irish mother-in-law!! Yum! I love golden raisins…I’ve never baked with them though. I put them in curried chicken salad! These look terrific! Thank you Michelle – I had them laying around and I just had to use them! 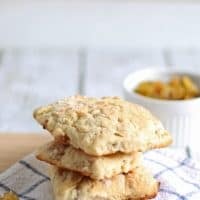 I love scones and these look fantastic! Thanks for linking up with What’s Cookin’ Wednesday!